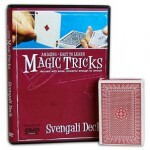 This instructional DVD will teach you some of the best card tricks that will amaze your audience! Easy to learn routines. A Bridge Size Pro Brand Svengali Deck comes with the DVD! Collect the series!